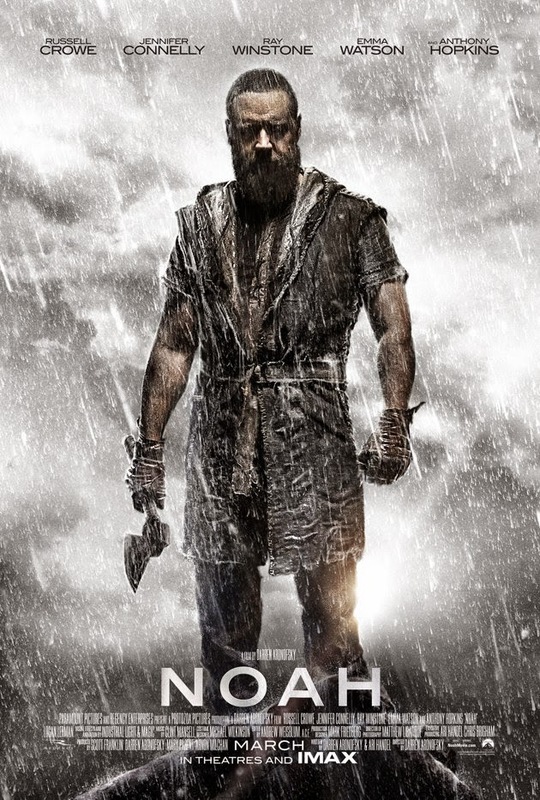 Noah was an entertaining film that had a nodding acquaintance with the source material, some decent performances, and a lack of narrative focus that turned it into a mess. It’s not boring, but it’s not particularly good, either. The more interesting elements were overshadowed by the thematic chaos: Aronofsky wanted to do a Biblical picture, but he wanted to give it a modern sensibility. The result was an attractive, disappointing failure. Green Day: It’s obvious that Aronofsky’s intent all along was to shoehorn environmentalism into a setting that had no place for it: the antediluvian Earth. The Biblical version of Noah explicitly states that the whole of humanity was bent toward sin: “God saw that the people on earth were very wicked, that all the imaginings of their hearts were always of evil only. (Genesis 6:5)” That won’t do in Hollywood. Making judgments about other people’s behavior or mores is Simply Not Done unless those mores conflict with standard Hollywood groupthink. So Aronofsky had to come up with a real sin: pollution. Strip-mining. Deforestation. That’s what would make God mad enough to drown the world. It’s ludicrous. He’s a Beauty: Ray Winstone did a great job as Tubal-cain, the main human antagonist. Brutal, thoughtful, manipulative, and entirely useless to the story. There was no reason to have him in the film. He did nothing to advance the plot, change the circumstances, or affect the outcome. He had the best lines, but there wasn’t any need for them or him. The silliest part was him stowing away on the Ark and sitting in the hold, hidden by Noah’s son Ham, for months without anyone knowing. At least we know what happened to the unicorns and gryphons and dinosaurs: Tubal-cain ate ’em on the long voyage. Somebody’s Watchin’ Me: The Watcher angels were extremely cool, but too reminiscent of stony Ents. According to the Bible, the Watchers were the angels who descended to Earth to sleep with human women. The offspring of these unions were the Nephilim, half-angel, half-human hybrids who were said to be giants: “There were giants on the earth in those days; and also after that, when the sons of God came in unto the daughters of men and they bore children to them, the same became mighty men who were of old, men of renown. (Genesis 6:4)” Because Aronofsky had to change the reason for God’s anger at humanity from sin to environmental disaster, the Watchers couldn’t be human-like enough to father Nephilim: they had to be monsters. Interestingly, Aronofsky did mine the Book of Enoch for the narrative that the Watchers taught men metalworking and other skills, which added depth. Noah’s Crazy Train: Aronofsky undercuts his own environmental schtick by having Noah turn into a cross between Paul Ehrlich and Charles Manson in the second half of the film. His extremism, self-loathing and hatred for humanity weren’t hinted at in the early stages to make his later insanity anything but jarring and out of place. It’s unbelievable to me that his family would, over the course of several months, accept his insistence that if Shem’s wife bore a girl, he’d kill the baby right there and then. They should have thrown him overboard as soon as they could, because he was clearly insane. H.A.M. : While I understand that to build tension in a story that everyone knows the outcome of, you have to create other conflicts, having Ham’s lack of female companionship be such a sticking point seemed clumsy, even absurd. Once again, Aronofsky had to go outside of the source material to create tension, which was unnecessary: there was already some weirdness going on in the Ark. “And they made their father drink wine that night, and the firstborn went in and lay with her father; and he perceived not when she lay down, nor when she arose. (Genesis 19:33)” Why not look at that for conflict? It certainly was…strange. Did they just have cabin fever? Methusaleh as Gandalf: There are magic rocks in the antediluvian world called Zohar, according to Aronofsky, which produce pyrotechnic effects not unlike the light crystals in Land of the Lost. This was also silly and unnecessary. What made things worse was the presence of Methusaleh, who had undefined sorcerous abilities that made him seem more like Gandalf than a servant of the Creator. He didn’t need to be there, or if he did, he should have had a stronger role. As it was, Anthony Hopkins did the best he could with him, but the character just wasn’t written well. I entirely understand those who take offense to Aronofsky’s altering of Scripture to advance a secular agenda in this film, but for me, the true offense was that the movie wasn’t that good. It looked good. The people in it acted well. But for the most part, it was a silly, overproduced mess. I’m not sure if it’s worth watching just to see how much Aronofsky hosed the Biblical story of Noah, but if you want a fantasy film about people and water and animals, then it wasn’t half-bad. Three out of five stars. The best review and definitive explanation of Noah can be found here. This is a far more insightful explanation for what's actually going on than Green Day or the others. The film's environmentalism is just a red herring.